This print has the seal of the Hayashi Tadamasa collection. The publisher was Nishimura Yohachi. The Fitzwilliam Museum has a print by Shinsai on this basic theme. 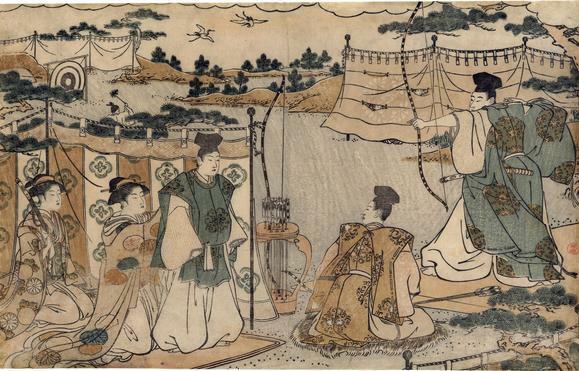 Their curatorial notes state: "Indoor archery was a very popular pastime in Edo during the first half of the 19th Century. It was commonly enjoyed in shooting galleries that were commercially run in amusement quarters and in some major temple or shrine compounds. Young girls were hired as helpers, and inevitably prostitution was quietly practiced in some places. Yumi hajime (the initial archery shoot) had grown out of the samurai custom of practicing archery on the seventh day of January or at the opening of a new archery field. Archery galleries for the public probably adopted a similar custom, taking the opportunity to charge more for their dressed-up girls." Illustrated in color in Ukiyo-e Hakka: Kiyonaga (浮世絵八華: 清長), vol 2, p. 112.